Christopher Ward is an entry level luxury watch company founded in London in 2004 by Mike France, Christopher Ward and Peter Ellis. CW is not considered a micro brand as their line-up is very broad, offering a lot of watches’ varieties; from dressy to sportive and tool watches also a women’s line which is completely discontinued now. 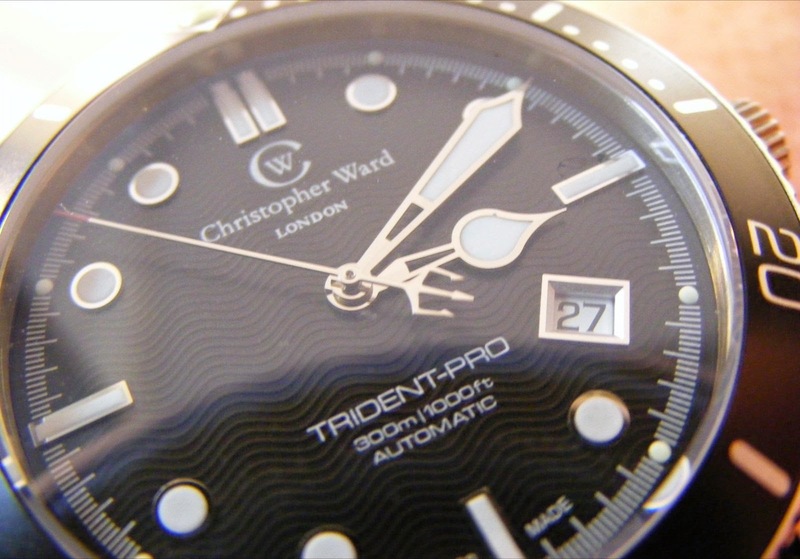 Their most popular watch and their best selling is the Trident C60 which is a diver watch. The C60 is an amazing watch, and it came with different bezel inserts’ and dial colors, my all time favorite was the khaki bezel one which unfortunately is currently discontinued. This watch has a lot of fans, and also a lot of criticism, one of those was the unbalanced dial design. The unbalanced is caused by the funky date’s position which is not aligned by the 4 marker and sitting around 4.5; the cause of this is probably the size of the dial compared to the date wheel. The dial has a very nice pattern, Omega’s inspired. Extremely nice hands inspired by Bremont Supermarine 500, with an amazing Trident second hand. Some watch enthusiasts were complaining about the watch size as it wears larger than a normal 42mm watch should; CW listening to their customers produce the C61 which is a smaller brother at 38mm. My complain about the C61 was the date window which is the same size as the C60; to me it is over sized and the dial overall was very unbalanced. They kept the main design aspects, but they have fixed the dial window position which I believe made the watch looks way nicer and dressier, keeping the “toolish” feeling to it. They kept the 2 sizes available, 42mm and 38mm to reach out everyone. They introduced new bezel inserts and dials’ colors; my all time favorite is the red bezel insert one. Also they have introduced a quartz one as well. While I believe the new C60 trident is a great watch, but the price tag is my only concern; the new prices place CW near Glycine and Oris leagues; not sure if this is a smart move though. This is my thoughts about this watch, but maybe I will take the plunge along the way, I really like it.